Municipal solid waste management can be done a number of ways. Traditional landfill methods can be used, municipal solid waste recycling can be done, or the waste can be turned into energy by being incinerated. MSW is produced locally, and does not need to travel far. These plants can be set up close to every city, or several rural areas, making it easy to turn community garbage into community energy. This energy uses a domestic source, so there are no large fluctuations in price simply because a new dictator took over an oil producing country somewhere in the world, and is now using their fossil fuels to hold the world economy hostage. There is an abundance of municipal solid waste in garbage dumps and landfills around the world to power the entire population for years without ever creating any more garbage. Municipal solid waste to energy plants can help get rid of garbage, so we can start bringing the world back instead of destroying it. Municipal solid waste energy plants turn MSW, or trash, into energy including electricity. There are a number of ways that municipal solid waste management is important. 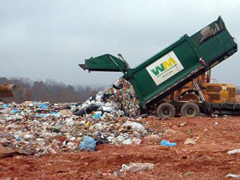 Municipal solid waste recycling is very environmentally friendly. With municipal solid waste energy, society receives a double benefit. Municipal solid waste management means finding ways to eliminate millions of tons of municipal solid waste, often called MSW, each and every year. Global warming and the state of the environment means that we have to find a source of energy which does not rely on fossil fuels like oil and natural gas. The world is dependent on electricity and could not operate without it, and municipal solid waste recycling and using this trash for energy makes sense because it solves both of the problems with one solution. Municipal solid waste energy plants can use either mass burn technology or refuse derived fuel technology. Mass burn is the method that is used most frequently, and in this process all of the MSW is combusted. In refuse derived fuel plants the waste is sorted before being combusted, so that certain recyclables like metals are removed before the waste is burned. This takes advantage of municipal solid waste recycling, so that fewer resources are used to replace these materials. Without waste to energy plants and programs, our already overflowing landfills would take up even more space. Americans contribute millions of tons of household garbage to the municipal waste stream, and we are running out of landfills to use. Transforming solid municipal waste into energy that can be used to light our homes just makes sense. Municipal solid waste management is crucial, because people will continue to create garbage and trash. In this sense municipal solid waste is a renewable form of alternative energy, one which is much more environmentally friendly than using fossil fuels. If the waste was not removed and taken care of, cities would become overrun with waste, rodents, insects, and germs. Waste to energy takes things that are already discarded, and turns these into electricity and energy that is much needed. This benefits society and the world twice, once when the garbage is removed and does not end up in a landfill polluting the earth and taking up space, and the second benefit is a source of energy that is cleaner and more eco-friendly than fossil fuels, with less pollution and contribution to global warming and greenhouse gas emissions. Municipal solid waste energy is the future of both municipal solid waste management and alternative energy sources which are eco friendly and meet the energy needs of the world. This source of alternative energy may very well be the main energy source of the future. It combines one solution to meet a number of different needs, and the entire process is simple and easy to understand. Posted on March 9th under Energy From Waste. I am very content to find this blog.Thanks for having the page! Im positive that it will be very popular. Important info discussed I’m pretty happy to find out this write-up and thank you for presenting all of us outstanding important information.Exceptional walk-through. I certainly appreciate this submit and think this is actually a excellent web page! I genuinely take pleasure in how it is very easy on my eyes too as the details are effectively written. I’m questioning how I may possibly be notified whenever a new post has been manufactured.There exists totally nothing at all worse than searching thru limitless blah blah websites merely to acquire a number of that always keep versions interest. We have subscribed to your rss feed.I have read your things just before and you are just as well awesome. I cherish what youve obtained here, take pleasure in what you are indicating and the way you say it. You make it simplify therefore you still manage to hold it intelligent. I cant wait to understand more from you. Various thanks for this material. It genuinely is challenging to acquire good document subject material and blogposts now days. I will most certainly be bookmarking the web-site. I only just stumbled upon your own article and will check out additional kinds. Seems like critically great information, incredibly superior specifics, quite a few with thanks to your creator. That is perplexing to me best now, still in general, the performance and significance is vast. Honestly a lot thank you after again and likewise most effective of good luck! This article is right on, MSW is the main problem for all municipal, national and international Governments, however its also a problem those same Governments do not want to focus too much public attention to because it also brings attention to their own lack of leadership, vision and effort in seeking and appying long term viable solutions. However the MSW issue is now hitting the critical point as land fills are about 90% full in virtually all countries, this represents opportunities for connected entreprenuers to present their local governments with smart Alternatives, not only providing a real solution to MSW, furthering the positive impact is providing the local government with the bi-product of MSW, in this case, Electric Energy and Diesel fuel. My company proudly represents 2 distinctm high energy output Technologies, using both MSW and Sorghum to provide Electric energy and Diesel fuel. Niroaltenergy@gmail.com and we can discuss.